Are they all going to get activated and turn into Jones' sleeper agents?! Is Jones a cortexifaner? Are the cortexifaners going to be used to "take" or help Jones get to yet another universe or time period? What the heck do you guys think this means?! JacobsMom wrote: I thought it was an interesting choice of the name "Canaan" since in the bible, the Canaanites were destroyed by another group of people. The Canaanites were a pretty advanced civilization . Maybe a reference to The Observers or our First People? But the name Canaan is also interesting, because like JacobsMom said, Canaanites didn't just destroy another group of people, but many archaeologists believe that some of the Phoenician people may also decend from Canaanites...The Pheonicians eventually for a time ruled Ancient Carthage, which is now modern day Tunisia! Note: Phoenicians had first official Democracy and hunted down and destroyed by Roman Empire in 3 Punic Wars. CHARLOTTE: [Reproachfully, in an adult voice] You know what my mum would say about you marrying an American. [Suddenly confident] I know more about ancient Carthage than Hannibal himself. DANIEL: It... it does make empirical sense that if this started at the Orchid then that's where it's gotta stop. But as far as bringing back the people who left in order to stop these temporal shifts? That's where we leave science behind. [Charlotte stumbles] You okay? I have often said that to me the Fringe team is similar to Dharma, and the Observers are becoming a little like the Others, or Charles Widmore....I think we are on a brink of learning about a temporal cold war...and how the Observers are keeping certain people apart (the constant idea) to achieve what ever they deem acceptable. Additionally, and unkowingly, making a further connection, did I make my new avatar and Siggy of Nero from Star Trek, as Emmanual Grayson tells Peter and Olivia in "The Road Not Taken" that the plot of J.J. Abrams Star trek is the truth of the war, in which he says, "Renegade Romulans FROM THE FUTURE. Here To Change The Timeline." I noted earlier in "The Somewhere Over The Rainbow" Thread how Romulan interior scenes in the film are in green and amber MUCH like the colors seen this season and the end of last, including then our title sequence. --But NERO is also a ROMAN EMPIRE Emperor's name! What's the chance Eric Bana's character would be BALD! I've been thinking about "Letters of Transit." DL pointed out that this is a reference to Casablanca and possibly hints that someone is trying to escape from somewhere. But in the movie (which I just happened to see on the big screen two weeks ago), the letters of transit are far more meaningful. - Ilsa pretends to still be in love with Rick so that he'll give the letters to Victor. - Victor knows that Rick still loves Ilsa and asks Rick to use the letters to save her. - Rick pretends it is over between him and Ilsa so that she will flee with Victor. In Fringe we don't really have a love triangle in the romantic sense, but we do have three people who would be willing to sacrifice themselevs for the others: Walter, Peter and Olivia. It would not be surprising to see any of them pull a Rick Blaine. Thoughts? In other news, have we previously seen this promo photo of FutureNina? supermodel wrote: I've been thinking about "Letters of Transit." DL pointed out that this is a reference to Casablanca and possibly hints that someone is trying to escape from somewhere. But in the movie (which I just happened to see on the big screen two weeks ago), the letters of transit are far more meaningful. Thanks Supermodel! It's been a while since I have seen it! Thanks for refreshing my memory! Note: I haven't seen ANY pics of Peter or Olivia for this episode! It seems like after that second teaser that this is the place/timeline the Observers derive, apart of "The Ministry of Science" and they control things, and obviously we know that includes "elsewhere" as well, as they come to our universe(s) to watch and occasionally intervene. The writers made this point to tell us that the Observers can be locked out of universes by other Observers (A Short Story About Love)...I would think they can also lock regular humans out too, and this episode may introduce us to the Observers hierarchy and just how much control they have on everything. A friend on the main site, Robert Ariadne, has believed for a long time that there is a "King Observer"...finally in an HD screenshot of a new Observer in these teasers, one with a trench coat, the original HTTP was listed as, "emperor observer"! Also looking at Lost again, I always liked and thought that James should be with Juliet and Kate with Jack, because I felt Kate and James became better people knowing the other two. --Part of Lost was about finding love, and for Daniel, we don't get to see him get close to Charlotte like some of the characters that move on had gotten to their love interests, which is why I argued earlier that I think eventually after a few more iterations, Charlotte might have become a better person by getting closer to Daniel. I keep thinking that the blue characters make the red characters better people and that's why Red Peter with Blue Olivia and Blue Lee with Red Olivia is similar and just as significant as those relationships on LOST and also considered "progressive". I came back because I remember when the other Casablanca reference was...first it was referenced in "Grey Matters"
PETER: (looking through a patient file) Third patient, Stuart Gordon. Just like Mrs. Crampton. Fourteen years ago, Doctor Paris refers him to a mental hospital with the psychiatric equivalent of a cough, which then develops into full-blown schizophrenia. Two days ago, he miraculously recovers. Apparently Mister Gordon thought he was the actor Sydney Greenstreet -- and walked around quoting Casablanca. That's funny. "Peter does not believe that Bolivia has never seen the movie. Bolivia takes a wild guess that it is a film featuring Ronald Reagan. Peter laughs and corrects her - it's Humphrey Bogart. Bolivia pretends to be kidding then makes another wild guess - the couple in the movie run away together and they live happily ever after. Peter sets her straight - the two star-crossed lovers separate - and never see each other again. As the two prepare to sleep, Peter's phone vibrates. At the end of the line, the cleaning lady from Liberty Island explains to him that a woman disappeared right in front of her. Her name is Olivia and she is trapped in the other universe." and this episode may introduce us to the Observers hierarchy and just how much control they have on everything. This got me thinking about the Observers and their possible motives. Just because they appear to only observe and that is what our FBI team started calling them doesn't mean they don't have a more nefarious purpose, right? We don't have any real evidence either way that they are benevolent or malicious. Maybe they wanted Peter to disappear because his existence prevents the Observers from taking control. Maybe September meant that Olivia has to die in order to prevent humanity from being subjugated by the Obesrvers' heirarchy. I'm not sure I really have a theory here, I'm just thinking out loud. I keep thinking there is something to using types of clones in space as special variables of means to control or preserve something...to be able to create collectives (bee hive minds)...and?or make variable exchanges such as August for Christine Hollis and Shapeshifters killing and taking on the identity of others. For "Fringe" fans, there are encouraging signs that the series might come back to Fox for a shortened fifth season of 13 episodes that would wrap up the show. 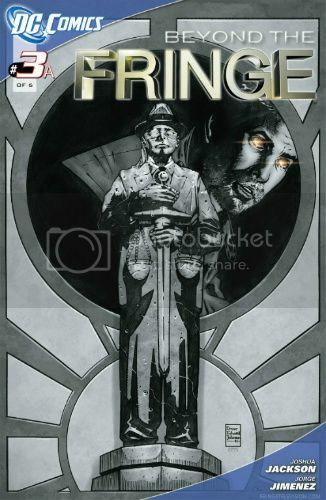 But even if "Fringe" doesn't get a reprieve, the writers appear to have hedged their bets. Joshua Jackson elaborated on that by saying “The door to the fifth season is opened in Episode 19 (airing April 20). If you watch that, you’ll have an understanding of where they want to take the series." OK, lots of sites have quotes from the cast at last night's event. They are all simiar but offer little bits and pieces. So here are a few of the more interetsing quotes. We've made sure that we've given an optional ending that will work and will satisfy people," Noble says of the May 11 closer. "We've definitely done that, and we're also hoping to finish our story off [with a fifth season]." Joshua Jackson (Peter) was mum on plot details, but says, "I can tell you that it does wrap up not only this season's storyline, but it really does wrap up kind of where the show started in Season 1. I know that [the producers] did that on purpose to give a satisfactory ending to our story. And two weeks from now is basically us auditioning what Season 5 would be if they gave it to us." "The last scene [of the finale] opens up an entire new storyline that, honestly, leaves one plot thread unresolved from the past four seasons," adds Lance Reddick (Broyles). Noble says he thinks that if Fringe does end here, it will go out at the top of its game creatively. "I've said all along that as we've come home we've gotten stronger and stronger and stronger, and what we've taken on are the big questions - we've actually answered a lot of the questions. We've thrust the major characters into the conflicts that everyone's been waiting for. We've just taken it all on, so the episodes ahead of us, I believe, are the best we've made." The actor says a final reckoning awaits his character. "Walter's always been going to have to face his nemesis, whether that's inside of his head or somebody else. He has to do that. We've known that all the time. I can tell you that at the end of this season, he does.'" And Reddick says things get particularly interesting for the alternate universe counterpart of his Agent Broyles. "I can honestly say that the storyline for Alt Broyles and what's going on with him and David Robert Jones gets wrapped up." “The rest of our story going forward is not about them all recovering their memories, so we kind of walked away from that, honestly, because it’s not the story they chose to tell,” Joshua Jackson revealed on the pressline at Warner Brothers’ “TV Out of the Box” exhibit at the Paley Center for Media. That being said, both Jackson and John Noble pointed to a moment in a recent episode in which they tried to showcase a bit of a newer closeness between Peter and Walter than what we saw at the beginning of the season. They went for a hug where one was not scripted. “It doesn’t get addressed directly, but I hope that you see those relationships are more amicable now,” Jackson continued. Well, things may be more amicable on this side of the story, but in the alternate universe, one beloved player is doing some bad, bad things. This season has given us great backstory episodes for Lincoln and Astrid (Jasika Nicole), and next up is one for Broyles-- well, alt-Broyles, anyway. “It all comes to a head,” Reddick promised, saying that we will soon see an episode (“The Consultant”) all about alt-Broyles and the confrontations his actions will cause. But Jackson still holds onto Peter as a device in the story, rather than just another character, so as much as he may want to learn more about Peter-- and as much as he may still have questions about the story overall-- he doesn’t believe we ever will dive deeper into Peter’s life ala those aforementioned backstory episodes. Not even if the show gets a fifth season. Press Release for 4x21 (which is now titled) "Brave New World Pt1"
Know doubt also named for the novel of the same name! Brave New World is a novel written in 1931 by Aldous Huxley and published in 1932. Set in London of AD 2540 (632 A.F. in the book), the novel anticipates developments in reproductive technology and sleep-learning that combine to change society. The future society is an embodiment of the ideals that form the basis of futurology. Huxley answered this book with a reassessment in an essay, Brave New World Revisited (1958) and with his final work, a novel titled Island (1962). Brave New World's ironic title derives from Miranda's speech in Shakespeare's The Tempest, Act V, Scene I:O wonder!How many goodly creatures are there here! How beauteous mankind is! O brave new world!That has such people in't!This line itself is ironic; Miranda was raised for most of her life on an isolated island, and the only people she ever knew were her father and his servants, an enslaved savage and spirits, namely Ariel. When she sees other people for the first time, she is understandably overcome with excitement, and utters, among other praise, the famous line above. However, what she is actually observing is not men acting in a refined or civilized manner, but rather drunken sailors staggering off the wreckage of their ship. Huxley employs the same irony when the "savage" John refers to what he sees as a "brave new world. "Although the novel is set in the future it deals with contemporary issues of the early 20th century. The Industrial Revolution had transformed the world. Mass production had made cars, telephones, and radios relatively cheap and widely available throughout the developed world. The political, cultural, economic and sociological upheavals of the Russian Revolution of 1917and the First World War (1914–1918) were resonating throughout the world as a whole and the individual lives of most people. Interesting about THE TEMPEST considering our guest star ...I am assuming now the Future (2036) is going to be playing a larger role. I was trying to think if Jessica Holt relates to anyone or anything? I tossed the name through the anagram server and got, "A Chisel Jots", "Ace His Jolts", Ash Coil Jets" "Chase Is Jolt/Jolt Is Chase/ Is Jolt Chase", "Josh Scale It", "Slash Ice Jot" are some of the semi coherent ones...Looking at "Holts" there is an Olav (sounds like "Olive" Holt...he was an upper atmospheric physicshttp://en.wikipedia.org... I was hoping for a name that went with the novel, but no such luck. Looking at the Tempest maybe "Miranda" might be her parallel? Still no news on a season 5 renewal for Fringe?? I thought maybe we'd hear by now with all the articles popping up this last week. "Brave New World" made me think immediately of the two universes combining together. How weird would that be! At least if Fringe is not renewed, it sounds as though the viewers will get some closure with the fact that there will be two endings to choose from for the season finale/series finale. I can already see how things are starting to wrap up nicely with each of the characters story lines as these last few episodes go on. But wouldn't it be cool to have these two universes come crashing together into one time line!! Have you guys seen the title credits sequence for the next ep? Awesome! Each of the 4 promo videos contained part of the youtube address, if you put them altogether you get to see the clip. I have tried three times to embed this and I can't figure it out, so you'll have to click. supermodel wrote: Have you guys seen the title credits sequence for the next ep? Awesome! That is one thing I love about Fringe and tptb....they have always given the viewers so many fun and quirky "extras" that make this show unique to many others. These 19th episodes are always a favorite of mine each season!! I loved it especially with "the man" facing the Observers (Peter?) and has his back turned against the audience. I also love that "FREEDOM" is encircled in barb wire, suggesting humanities freedom (future) has been kept in "loops". I have taken the liberty been forced to watch several episodes before Friday's air date...I just watched "Inner Child", "Bad Dreams" "The Road Not Taken" and "There's More Than One of Everything"
Additionally when I first saw the promo art for the show I always thought of His Dark Materials series and that the yellow dots represented 'soul energy' (God Particle/"Dust")...In "Bad Dreams", Walter mentions Belly and he theorized that there is a "god particle" and Walter referrs to it as a "pyro-ton", as people with pyro-kenesis don't just start fires, but they "excite energy" (Olivia activates Nancy Lewis). WALTER: Matter is just energy waiting to happen. The average adult at rest contains enough potential energy to explode with the force of five very large hydrogen bombs. PETER: You know, theoretically, you're actually right? WALTER: Ho ho ho ho! My son finally agrees with me! Uh, Agent Farnsworth, take a note of that. PETER: Unfortunately, we're just not very good at releasing it. WALTER: No. It needs a spark, of course - a trigger. ASTRID: So what do you think would've released it in her? WALTER: Some say a particle is to blame - the appropriately named 'pyroton'. Maybe we could finally prove that it exists. Peter! Fire up the electron microscope! Spoilery goodness! The Observers took over in 2015. Yikes, that is jsut three years from now! So late last night I got access to the full episode in advance, but I haven't had time to watch it!